Tracking down the hard-luck story of Melvin Mills, a founding father of the frontier town of Springer. Springer, an old Santa Fe Trail town, is about 70 miles northeast of Las Vegas and 40 miles south of Ratón, via I-25. The Mills Mansion on First Street is open for tours by appointment. Because it’s also a private residence, plan as far ahead as possible. The mansion is also for sale. E-mail Tim Hagaman to schedule a visit at timhagaman@msn.com. Up in northeastern New Mexico, where the grasslands and the sky seem to have the run of the place, there’s a house at the end of First Street in Springer that stands apart from everything else. Grand in every 19th-century sense of the word, it is a brooding hulk of a place, from its mansard roof to its four chimneys to its wraparound second-floor veranda overlooking a forgotten orchard. This house was engineered, not constructed. 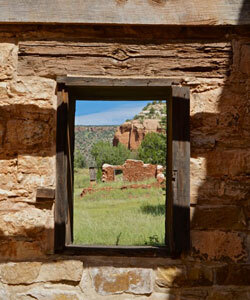 Double-paned windows rest deep inside thick adobe walls. Rain gutters grow fatter as they approach the giant cistern. (And I do mean giant—picture a grain silo.) The house changes throughout the day as it reflects its surroundings—bright and alive in the sheen of the new morning, demure in the orange glow of sunset. Walk along the porch, and the seasoned planks groan a lament to the loss of their youth. For a house, it comes very, very close to having a soul. Did I say house? I meant mansion. This is the architectural legacy of Melvin Whitson Mills. 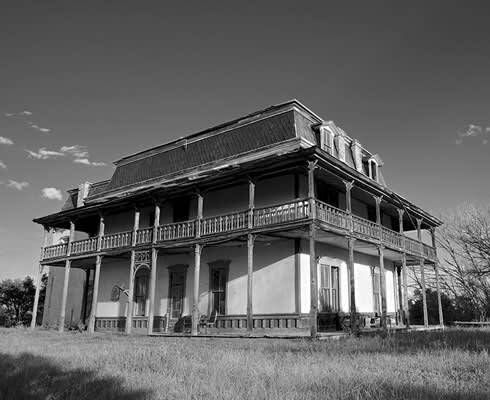 Having grown to prominence in the developmental years of northeastern New Mexico, first as an attorney, then as a territorial legislator, Mills needed a place this big to hold himself, his wife, his mother and father, and his four adopted daughters and one adopted son, along with the history he had accumulated over his lifetime by being in the right place at the wrong time, again and again and again. I wanted to meet Mr. Mills. A challenge, of course, since he died in 1925. But I was determined. 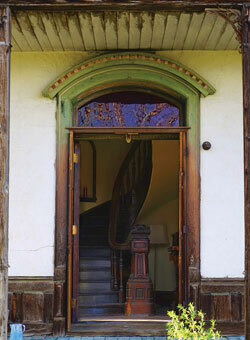 A place like the Mills Mansion has been weathered as much by memories as by time. Put yourself in that place, I thought, listen carefully, and you might hear something. Like the sound of hammering from the basement against the steady thump of a nineties-music megamix. The hammer belonged to Andrew Ward, as did the laptop streaming music while he worked. Andrew lived at the Mills Mansion as a family friend of the current owner, Tim Hagaman. Andrew stayed in the room off the kitchen, Tim stayed in the newer wing. I, meanwhile, was invited to sleep in a room on the west side of the house. There was plenty of mansion to go around. In the basement, as he stood before his worktable, Andrew used a mallet to gently nudge together the pinewood frame he was constructing. Around him were the tools of his trade: pipe clamps, wood glue, screws kept in old glass jars that Andrew found while cleaning the basement. The sunlight and breeze coming through the open window worked together to warm the room. The stone walls did their best to muffle the noise while adding a bit of decorative charm, despite revealing patches of yellowed newspapers once used as insulation. Andrew added supports, three on either side, then slid boards in place between them, measuring each angle as he went—if the frame wasn’t square, the rest wouldn’t line up. A headboard and an endboard, then two top rails, and the structure took shape. It would make a fine resting place for someone when they were ready for it. A beautiful, handcrafted wooden casket. When Andrew learned the high cost of caskets after his grandmother passed away, it inspired him to use his knowledge of woodworking to design his own high-quality, affordable caskets. He built a prototype casket and entered it in the Colfax County Fair. His first-place ribbon, along with the two-dollar check he received as a prize, hung on the basement wall. Melvin Mills would certainly have approved. Mills was an entrepreneur himself. He owned a horse ranch in Mora County, a stagecoach line that ran from Kansas to New Mexico, even a mercantile in Springer (advertising “ranch supplies of every description”). Andrew gave me a tour of the mansion. The sun through the red transom window over the front door cast a crimson glow over the elegant wooden spiral staircase at the front of the house. From the first floor, with kitchen, parlor, and front room, the staircase led to the second floor, with a giant ballroom and other rooms that served as bedrooms and, later, apartments. The third floor and attic had even more rooms, a total of more than twenty in all. “It was the Ritz when they built it,” Andrew said succinctly. That was 1877, and by that time, Mills had already lived an incredible life. Born on October 11, 1845, in Sparta, Ontario, he later moved to Michigan with his family, graduated law school, then followed his parents to New Mexico. As a young attorney in Colfax County, one of his more notorious cases was the 1870 defense of Charles Kennedy, a scoundrel who murdered travelers over Taos Pass and kept their bones in a sack. Mills got a hung jury, but frontier justice ultimately decided that case when a local mob lynched Kennedy. A few years later, Mills, who was by then a member of the territorial legislature, himself almost suffered the same fate when he was accused in the killing of Cimarrón minister Reverend Tolby in one of the incidents that started the Colfax County War, a 10-year battle between landowners and squatters on the giant Maxwell Land Grant. Mills’ loyalties lay with the grant owners, putting him at odds with settlers, who were eager to believe the accusation and had taken him prisoner. Cavalry soldiers from Fort Union rode into Cimarrón and rescued Mills from an angry mob. It was a rough life for someone raised a Quaker, who didn’t believe in violence. Things improved considerably for Mills when he platted the town of Springer and moved there around 1877 with his wife, Ella House. Mills helped establish Springer as the county seat and was instrumental in getting the Atchison, Topeka and Santa Fe Railway to roll through, knowing it would open the town to greater things beyond. Then, likely inspired by the orchards of his hometown along the banks of Lake Erie, Mills planted fruit trees in the Canadian River Canyon south of Springer. This, the Mills Orchard Ranch, with its acres of succulent fruit trees and rows of vegetables, became Mills’ grandest achievement. As he showed me around the basement, Andrew made a point to tell me that he used two five-gallon buckets and a shovel to remove several feet of dirt when he prepared the space for his workshop. And he didn’t find any tunnels, disproving one of the most persistent legends about Melvin Mills today—that he used underground passages to conduct furtive business affairs. One tunnel supposedly led from the house to the bank downtown. Another led to the river, so Mills could make a quick getaway. It’s not clear what Mills would be getting away from, exactly. But all the stories share a common theme: Fate would one day have Mills in its sights, and it wouldn’t be pretty. The open land between Springer and Mills Canyon gives no hint of what you’ll encounter at the other end. The vast grasslands stretch outward in every direction until they meet the horizon, where the boundless blue sky takes over. Then you find yourself perched at the top of the road into Mills Canyon, and everything changes. A sign advises caution and warns that RVs are not recommended. Beyond that sign, it’s a two-mile, anxiety-ridden drop into the canyon on a primitive road with no place to turn around en route. You cross this threshold, you’re in. 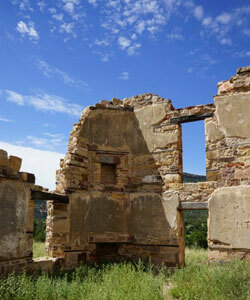 Andrew and I had come to see the ruins of the Mills Orchard Ranch. I nudged the car over the start of the road. We were in. All at once, the road became a gauntlet. It taunted us with mud puddles, then with sharp rocks protruding from the mountainside, then with ruts and washouts and narrow curves. There was no safety net but a steady hand on the wheel, no guardrail but common sense. I remembered the sign at the top of the road. “At least we’re not trying to do this in an RV,” I said. Andrew agreed: Things could be worse. That made me feel better. Inches from death, you take what comfort you can get. And yet, it was beautiful. To our right, the floor of the canyon made a serpentine path between the gentle slopes of the canyon walls before disappearing behind them to the north. Juniper trees and desert grasses clung to the brown earth on either side. Here and there, giant boulders had come unmoored from the walls and tumbled into a cluster on the canyon floor, leaving rugged scars to mark their fall. A line of trees hid the Canadian River, but you could sense its capricious waters swirling through the canyon. Overhead, soft white clouds drifted across a sky of brilliant blue as their shadows raced to catch up on the ground below. Of course Mills would plant an orchard here. It was grand, too. We reached the bottom with a sense of relief and the feeling that anything was possible. The road followed the river to the site of the Orchard Ranch, a complex of buildings that once had included a main house, bunkhouse, smithy, and corral. A small placard by a parking area discussed the history of the property and showed a layout of the buildings. It also had a photo of Mills, the only one known to exist: tight and angular face, bushy mustache, deep-set eyes. We wandered among the ruins of his ranch, greeted occasionally by lizards, serenaded by songbirds nesting in the canyon walls. As we stood in the two-story stone main house, empty and roofless today, we tried to picture the arrangement of rooms based on what clues were left—the doorways, windows, fireplace shafts. We could have gone back and looked at the placard, but there was a sense of wonder in not knowing, as if we’d discovered the place and had to rely on educated guesses to fill in the gaps. Andrew wanted to show me an old steam engine he’d found upriver, which would require a four-mile round-trip hike through the remains of the orchard and farther into the canyon. We drove to a spot closer to the river and parked, then used a matrix of rocks in the water as a natural bridge to cross to the other side. With soggy feet, we began the journey. Our arrival initiated the canyon’s emergency broadcast system. Hawks soaring overhead squawked, and all the small creatures on the ground darted into the grass for cover. This was where the orchard once grew, and a few old trees still stand, withered and overtaken by scattered scrub bushes and hedge apple trees. A hundred years ago, this place overflowed with rows of peach and pear trees, plum and apricot trees, walnut and chestnut—the harvests would have been incredible, much of it sold to Harvey House restaurants along the railroad. The sun was warm on my cheeks and hands. The air was still but pleasantly cool, and every so often a butterfly flittered across our path. I felt closer to Mills here somehow than in his mansion back in Springer. In his mansion, he worked. Here, he dreamed. Big dreams that smelled of peaches and apricots; little dreams that flitted across his imagination like those butterflies, and were probably just as quickly gone. Occasionally, a plane passed overhead, the buzz of its engines reverberating through the canyon. At one point, wild turkeys scattered on the trail before us. Andrew took a player from his backpack and played music through the speaker as a way to announce our arrival to whatever might be up ahead. We marched forward to the sound of Gershwin’s Rhapsody in Blue. Gradually, I began to sense a change around me. I couldn’t shake the feeling that the canyon itself was aware of our presence. There was a power here—we weren’t just hiking up the canyon, we were being allowed to hike up the canyon. The rocks and river and trees no longer felt like natural objects, but rather more like guardians. To pass safely, it seemed, we would need to listen to their story. When the next plane passed overhead, I imagined the buzz of its engines was the sound of the rain that fell incessantly for days back in September of 1904. After struggling to contain its turgid waters, the Canadian River at last surrendered and overflowed its banks, sending water rolling out across the canyon floor. The orchard and outbuildings were deluged. When the mouth of the canyon clogged with debris, the water backed up, drowning the fruit trees and the livestock, soaking the earth underfoot into layers of mud. The destruction all but ruined Melvin Mills financially. He rebuilt the orchard, but his debts accumulated until, at last, he lost his grand Springer mansion to the bank. He was forced to move into a smaller house across the street, where, from a side window, he could see his mansion. At last we reached the steam engine—or maybe it was a boiler. It was some part of the extensive irrigation system that drew water from the river into the orchard. It was still here, all but lost in the middle of a giant earthen gully. The return trip seemed shorter, as they always do. The calm returned, too; the canyon, it appeared, had accepted us. Birds sang, the river babbled joyously, and a breeze arrived to accompany us. After recrossing the river, we found our footprints in the dirt from earlier in the day. Fresh prints had been added alongside them in the meantime—possibly a coyote. On the way back up the canyon, we met a pickup truck coming down and pulled over to chat. Experts now, we advised our fellow travelers to be cautious on the remainder of their journey. A bit farther on, we came to a stretch of raised and jagged rock surfaces. Hand steady on the wheel, determined, I accepted the challenge and powered through it to the top. We’d made it. Tim Hagaman, current owner of the Mills Mansion, invited me to help film a reenactment he had planned at the old Springer courthouse. My visit coincided with the 130-year anniversary of the end of the Colfax County War. Of course, Melvin Mills was involved. There were a good number of people at the courthouse when I arrived. Everyone was dressed in period attire. Even the courthouse, built in 1881, strutting its Second Empire style. Springer lost the county seat to Ratón in 1897, and the building now serves as the Santa Fe Trail Museum. Tim made a fine director, versed as he was in the history of the area. Tim first came to New Mexico from his native Illinois in 1974 as a scout at the Philmont Scout Ranch. He bought the mansion in 2002, happening to close on the property on Halloween day. Every Halloween for years thereafter, Tim would find the biggest candy bars he could and give those out to trick-or-treaters. He didn’t want them to be afraid of the place. We began with a scene of the cowboys John Dodds, played by local realtor Landon Newton, and Sam Littrell, played by Ratón resident Jim Stearns. The filming started as Landon and Jim arrived in town to sell feed, just as their historical predecessors had in 1885. Landon volunteered a property he owned downtown as the feed store, and sacks were placed outside for effect, but there was a problem: We were short a feed-store owner. Tim lent me his cowboy hat, Landon corrected me when I put it on backwards, and a star was born. Dodds and Littrell used the money to raise heck in town, but we skipped that part and went straight to Dodds’ arrest by Constable Carter, played by Lee Briscoe. Landon’s border collie, Jag, seeing his owner being arrested, jumped into the scene, too, trying to figure out what was going on. Then the action shifted back to the courthouse, where Dodds was placed into one of the jail cells. The next scene had angry cowboys coming to town to rescue their associate. And that’s when I met Melvin Mills. It must be, I thought, that Tim, with all his connections to the past, had somehow summoned Melvin Mills himself to star in our reenactment. The man who sat at the desk playing Mills as district attorney, wearing a black robe and holding a mallet—the same shock of hair, the same forceful eyes as in the photo on that placard. It was him! Tim ran out of space on his phone, so I was called into service as videographer. I caught the action as cowboys mimed their anger at Mills by shaking their fists and then storming off, one stopping briefly on the way out to admire a museum display. Tim played George Curry in the pivotal gunfight scene on the courthouse lawn. Curry would later go on to serve as governor of New Mexico, but today he didn’t have it so good. He was arrested in the fracas, and his brother John, in a second role by Jim Stearns, was killed. Three local women—Yolanda Jensen, Thelma McFall, and Pat White—looked on in grief. A few scenes later, Tim walked out of the courthouse, now free, raising his hands into the sunshine. The Colfax County War had ended, as had our movie. At the post-wrap cast lunch at Elida’s Café, I snagged the empty seat next to Melvin Mills. He wasn’t actually Melvin Mills, turned out. He was Steve Jensen, who moved to Springer as a young man with his family in 1972 and now works at a car dealership when not portraying the town’s ill-fated founder. Melvin Mills’ grave in the Springer Cemetery is unmarked today; whether it ever had a headstone isn’t clear. Tim thinks he’s found the plot. He agreed to show me. Tim has retraced many of the steps Mills took in his life, only to find that they entwined with his own family. After coming to the United States, the Mills family settled in Adrian, Michigan, not far from where Tim’s father himself was born. In 1869 Mills graduated from the University of Michigan Law School, the same alma mater as Tim’s uncle. On a trip to Canada once, Tim felt inspired to find the Mills homestead, where Melvin was born. As the sun descended toward the western horizon, Tim showed me the patch of land beside the juniper tree in the cemetery where he thinks Mills, his wife, and his mother and father now lie. Tim has marked the plot with bricks in the shape of a giant M.
When death finally came for Mills on August 19, 1925, it knew where to find him. In accordance with his wishes, Mills had been allowed to die where he most wanted, safely cradled by the grand mansion he built at the end of First Street, the one that stands apart from everything else. I don’t believe Mills was afraid when he died. A man like him must surely have known that the return trip always seems shorter. Regardless of where it happened, I hoped that a window was open and a breeze was blowing in. And I hoped that a train was passing by, sounding its whistle, and that Melvin Whitson Mills heard it. David Pike is writing a series of articles on small-town New Mexico.